Before I get into the details of this “Sophisticated Punk” look, I want to share something with you. Lately, I’ve been thinking a lot about style as a means of creative expression. And although I love keeping up with and illustrating what’s new and fab in fashion, I enjoy educating myself about timeless style elements. Moreover, I adore combining and playing with disparate style elements. This “style page” is my first attempt at sharing my love of researching and playing with different style elements. In addition to keeping up with trends, I will continue to research iconic style elements and influencers and will share my take on them with you—via my illustrations of course. I hope you’ll come along on this journey with me. Now, onto the “Sophisticated Punk” look. This look is a mix of sleek separates and elements that reference punk fashion. In the 70s and 80s, punk culture was all about rebelling and challenging the status quo in music, fashion, and more. But many designers, including Vivienne Westwood, Jean Paul Gaultier, and Riccardo Tisci, have embraced punk elements in their designs. 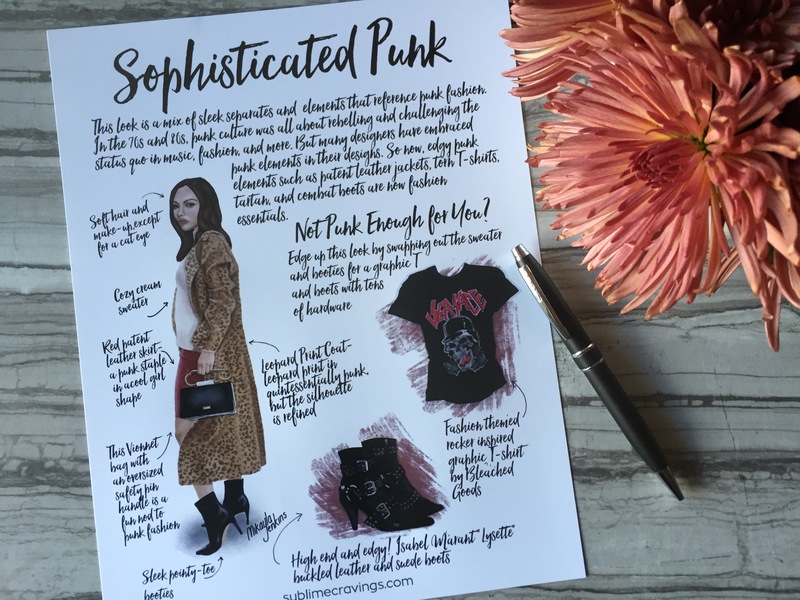 So now, edgy punk elements such as patent leather jackets, torn T-shirts, tartan, and combat boots are now fashion essentials. Craving more fashion and beauty illustrations? Subscribe to my newsletter for exclusive content, wallpapers, and more straight to your inbox. Thanks so much, I appreciate the feedback! Mikayla this is such a cool illustration. These illustrations and your narrative should be in a book. Cool. Thank you so much, Joanna. I have been thinking about doing an illustrated style and creativity focused book. This piece is my way of “dipping my toe in the water,” so I’m so flattered and pleased by your feedback! Hi Mikayla! This is a fabulous idea and I look forward to reading this segment of your blog from now on! I love the way you’ve brought the concept of Sophisticated Punk to life, in your gorgeous artwork and accompanying text. It’s a look which always makes me think of Kate Moss, as she pulls it off which effortless elegance! Your illustrations are stunning as always Mikayla! Thank you so much, Saba! I’m thrilled you like it. I didn’t think about Kate Moss at all when I put this together, but now that you mention it, I can totally see it (imaging me hitting my forehead in disbelief when you read this sentence)!